1 in 4 nurses has been assaulted at work. That's not OK.
Did you know that the likelihood of health care workers being exposed to violence is higher than prison guards or police officers? Disturbing and alarming incidents have put a spotlight on an alarming truth: physical and verbal abuse against nurses is a serious problem in healthcare settings across the country. REPORT abuse against nurses whenever I safely can. SHARE this pledge with your friends and family to sign. We need your help to end nurse abuse! Take the pledge today and share with every nurse you know. "I truly believe that what happened to me can lead to positive change in our profession. That’s why I decided to speak out: to stop this abuse from happening to others." 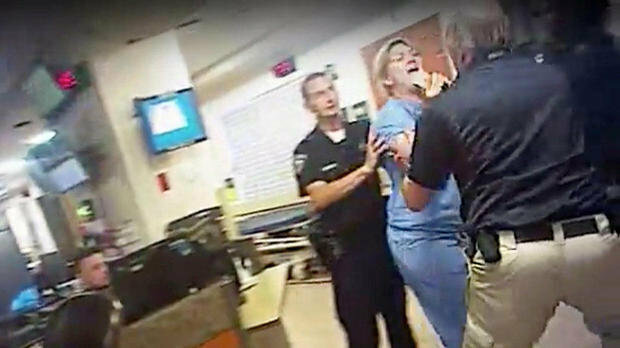 Image from video footage of Utah nurse Alex Wubbels being wrongly arrested.